Benign enlargement of the prostate is a condition that affects millions of men, including well over 50% of men over age 60. While this condition is usually harmless, for some men it can hinder healthy urinary function and possibly lead to more serious side effects if ignored. Fortunately, there is something that can be done to encourage healthy prostate function. 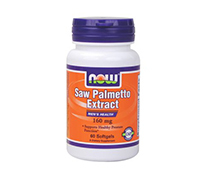 NOW Saw Palmetto delivers 160 mg of premium saw palmetto extract, and is naturally rich in bioflavonoids, sterols and fatty acids – all shown to help support optimal prostate health. Directions: As a dietary supplement (especially for men) take 1 softgel twice daily with meals.